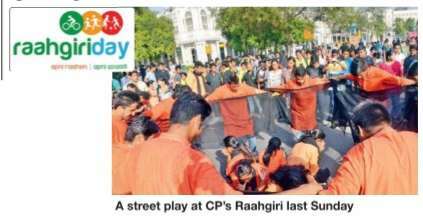 Start this Sunday with some fun workouts at CP's Raahgiri Day . Attend the zumba session by YHC Fitness, or the QBA session by Asquare. Enjoy some are. Enjoy some bhangra at the live session by Simranraj, with Bhangrabics or the bhangra session by Bhangra Destiny and show off your Govinda moves at the Bollywood Workout session by Yogstars. You can also attend the jiving and zumba session by Rotary Club Of Delhi Mid West or enjoy the dance per formance by Aman Biradari, Sahyog, Love Care Foundation. Theatre lovers can watch the play by Sasakawa Leprosy India Founda tion as well as the theatre performances by Dhanutsav at B Block.